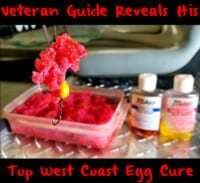 Normally, when targeting Great Lakes salmon in the fall I use Red and Pink Fire Cure eggs. However, when conditions get tough and there’s a lot of pressure on the water I like to experiment with different colors. Fortunately, I’ve had a surplus of skein, which has enabled me to try out a few new color combinations the last few weeks. Consider this: when fishing is tough we don’t just throw the same lure all morning we try different colors. This is part of the reason I like to try different colors of eggs. By trying different colors within the same general spectrum it could be what’s necessary to get the salmon to bite particularly when they aren’t chomping on Red and Pink Cured eggs. That’s not to say abnormal colors like chartreuse eggs are always going to work. But think about it, oftentimes showing them something different is what gets them to bite. I’m trying to generate a response and if many drifts with red, pink or orange isn’t getting the job done it’s time to try something else because we know salmon are egg eaters. This year, with the introduction of Fire Dye it gave me a way to dye my eggs and bring more vibrant colors without going through a lengthy process. However, keep in mind, we’re still using Fire Cure to cure our skein. Meanwhile, the Fire Dye acts as an agent to alter the egg’s color. Fire Dye on it’s own won’t preserve them like Fire Cure does. On other hand it does wonders with their color. Using Fire Dye sparingly brings dominating colors. Remember this stuff is potent. It’s important not to use too much. Cure your eggs like you normally would with Natural Fire Cure for fall salmon. Fire Cure is the vehicle to cure the eggs and prepare them for a color change. Using the natural will keep the eggs in their natural color. Allow them to juice for two hours. Natural Fire Cure being added to skeins. Once there are juices in the container add Fire Dye. It’s important not to add too much dye, simply because of how potent it is. On these batches I used 12 drops and it did this much to my skeins. I used Purple, Blue and Chartreuse Fire Dye on this batch. Nevertheless, if you are an angler who uses Pink, Orange and Red Fire Cure, you can also add Pink, Red and Orange Fire Dye if you want a more vibrant egg. This process is simple. Squirt the dye on and let them sit. Keep in mind, the more dye you use the stronger the colors will be. The less dye you use the less potent. Step 3: After adding the dye put the skeins in the fridge, wait 24 hours and they are ready to fish. 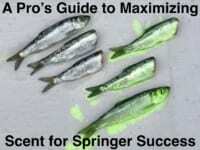 With all this being said when fishing is tough I rely on my proven producers most of the time. However, as most anglers know it’s important to have that oddball color in your arsenal for those salmon that have seen everything. This is when it’s best to break out your Purple, Chartreuse or Blue Fire Dye eggs. Editor’s Note: Guide Andy Bliss is based in Upstate NY. For more information on his fall salmon, brown trout and steelhead trips please visit http://chasintailadventures.com.